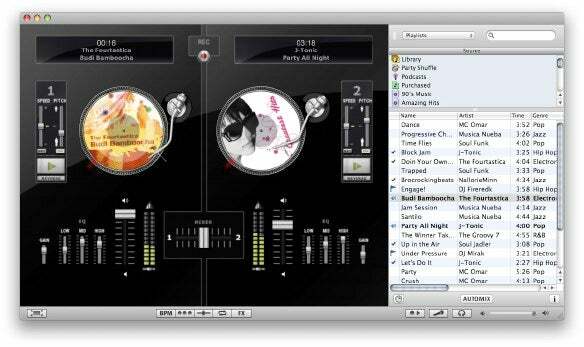 Algoriddim on Friday announced the release of Djay 2.2, an update to their DJ music software for Mac OS X. Djay costs $49.99; the update is free for registered users. Djay uses a turntable interface metaphor for music DJs interested in using a Mac and iTunes library as the control for their music. You can mix songs using two interactive “virtual” turntables, performing live, or creating and recording mixes at home. New to the 2.2 release is the ability to control functions through “multi-touch” finger gestures on new Apple laptops. You can rotate gestures on the trackpad to browse the iTunes library, for example, and throw the selected song onto one of the turntables using a “swipe” gesture. Two-finger gestures let you scratch MP3s on the virtual turntables, crossfade between songs and adjust speed, volume and equalizer settings. Two-finger gestures are supported on all Mac laptops that feature two-finger scrolling, so it works with iBook, PowerBook, MacBook and MacBook Pro computers. Users of the new MacBook, MacBook Pro and MacBook Air also gain additional three-finger swipe and rotate gestures, as those trackpads support the “multi-touch” gestures. System requirements call for a 1GHz G4 or better (including Intel), 512MB RAM and Mac OS X 10.4 or later.